John was born June 24, 1924 in Aslackby, a small village near the town of Bourne in Lincolnshire, England to Edwin and Jennie Almond. His father Edwin known as Ted was a farmer. The family came to this district in 1929. He received his education at the Nober Public School in Townsend Township. At the time he enlisted he was employed at the Massey-Harris plant in Brantford. Two of his brothers are serving with the Canadian Army in Italy. Gunner Noel Almond with the RCA and Pte. Alan Almond with the RCASC. He also had three sisters; Mrs Harley Whitehead of Simcoe, Miss Jean Almond of Brantford and Mrs. Lorne Cooper at Home’ as well as two other brothers, Lawrence and Peter both at home. 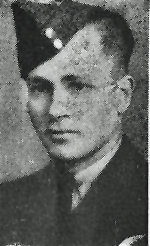 John enlisted with the RCAF in May 1943. Following training at Regina and Trenton he graduated as an air gunner from the Macdonald Bombing and Gunnery School in Manitoba. He went overseas in November of 1943. 30 Lancasters from 408 and 419 Squadrons were joined by 60 Halifaxes from 424, 427, 429, and 433 Squadrons on an attack of the 2 rail yards at Aachen, Germany. The crews were over the target at between 16,000 and 20,000 feet, releasing 810,000 lbs of high explosives. According to reports, one rail yard was severely damaged with some damage to the others. 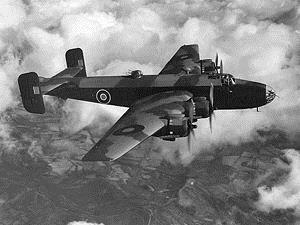 Flying Halifax III LW-157 coded QB-S, the crew failed to return from this operation. All were lost without a trace. His name is recorded on the Runnymede Memorial, Surrey, United Kingdom. He is commemorated on Page 236 of the Second World War Book of Remembrance.